Newark Community Day is Sunday, September 15 from 11am to 4pm on the University of Delaware’s Green. 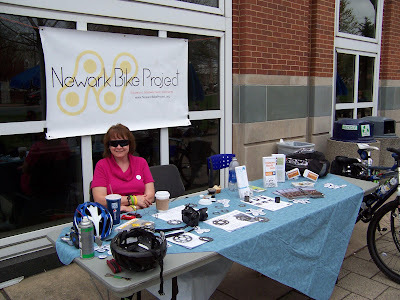 The Newark Bike Project has space number 1542 which is immediately adjacent to Delaware Ave next to Sharp Hall (see map below). If you are available to volunteer or stop by the event, please do so and help spread the word about NBP! If the weather looks questionable, you can call the Leisure Time Hotline at (302) 366-7147 to check if the event has been cancelled (Rain date next Sunday). Hope to see you there! Angela Connolly tabling at the Trabant Center during Earth Week, April 2013.